Photo: Roger Wade (See more of this home here). The beauty of wood is probably the first thing that comes to mind when thinking of a log home. 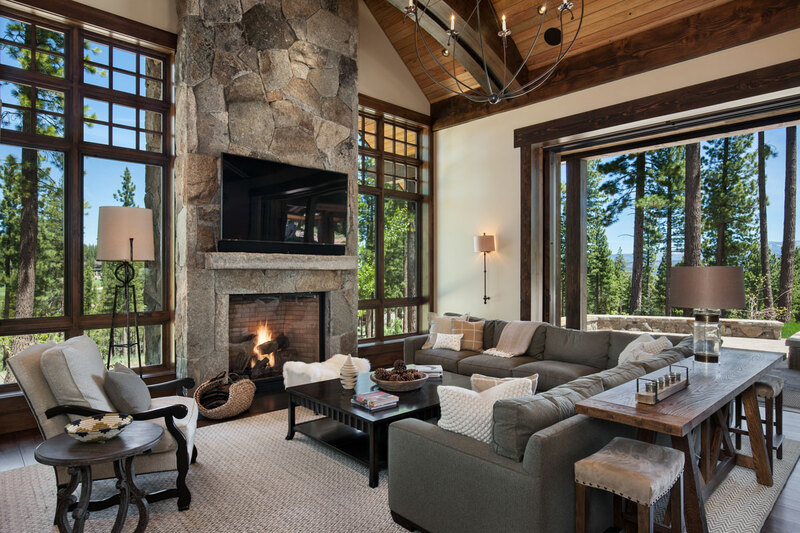 But wide expanses of glorious windows are often what make a log home all the more breathtaking. Choosing windows is an important task, because they will not only affect your home’s looks, they’ll play a major role in its energy efficiency and in its bottom line. How to make critical decisions on windows? Start with help from an expert. If you’re using an architect or designer for your home project, he or she should be able to guide you in making wise window choices. Your builder or log provider will also have words of wisdom concerning windows. Along with your budget, you and your designer will consider your home’s climate, its views and its exposure to sun, wind and weather. You’ll feel more comfortable taking part in these discussions if you have a basic knowledge of window styles and options. Double-hung or single-hung windows have one or two sashes that lift up and down horizontally. Sliding windows have sections that slide open to one side. Casement windows open out — often by using a hand crank located near the windowsill — and have hinges along the sides. Awning windows open out with hinges at the top of the unit. The terms “bay” and “bow” refer to a group of windows that jut out from the wall of a home. Transoms are typically rectangular-shaped windows that are placed over a door. Side lights are long vertical windows that are placed to the side of a door. Many years ago, when glass-making was primitive, only small panes were able to be produced. These small panes were set into a wooden grid in a window. As the industry evolved, sheets of glass became larger, giving today’s homeowners new options: You can have windows made with small panes set into a grid (these are called “true divided light” windows) or you may have a removable grid (or grille) placed on the interior side of the windows to give the appearance of true divided lights, but allowing for easier cleaning of the window when the grid is removed. Some manufacturers float a grid between two panes of glass in their windows — making window washing even easier. You’ll also be able to choose from a wide range of grid styles as you plan your home. If you want your new home to resemble homes of a certain historic period, look for a window and grille style that’s typically associated with the era. Other choices for bringing natural light into your home include skylights (both fixed and operational, or venting) and glass patio doors. As with windows, innovations in skylights and glass doors have made them more attractive, energy-efficient and user-friendly. Another important decision to weigh is what material your windows will be made of. Choosing from vinyl, wood, aluminum or fiberglass is easier if you understand the benefits and drawbacks of each. Aluminum, generally the least expensive material, is strong, light in weight and low-maintenance, but the material is not very energy efficient. Vinyl offers greater energy efficiency than aluminum and is also fairly low-maintenance. It is, however, more expensive than aluminum. Fiberglass offers similar advantages to vinyl, along with the strength of wood. As the traditional window material, wood is energy-efficient but is typically higher-priced and requires a finish — either paint or wood treatment — that must be maintained. To cut these maintenance tasks, many window manufacturers are now cladding the exterior of their wood windows with aluminum, vinyl, fiberglass or even copper. Window manufacturers’ innovations extend to the units’ glass (or glazing) as well. Double or even triple panes of glass, some with argon gas sealed between the panes, make windows more insulating. To further boost energy-efficiency in “Low E” windows, a metallic coating is applied to the outer pane of glass to reflect the sun’s rays and reduce solar heat gain. As you shop for windows, you can compare labels on the units from the National Fenestration Rating Council (NFRC). These labels explain the window’s R and U values, which measure how well the window insulates, along with information on the unit’s solar heat gain coefficient. In simple terms, a lower U-factor window is better able to keep interior heat from escaping outdoors. A window with a lower solar heat gain coefficient will perform better at blocking unwanted solar heat. For more information on how to read the NFRC label, go to www.nfrc.org. You should also look for the Energy Star logo on windows you buy. This label will include a climate map explaining in which areas of the country the window meets the Energy Star criteria. For more information, go to www.energystar.gov. Another web site that offers pertinent information for window buyers is www.efficientwindows.org. On the site, you’ll find tables to help you compare the energy costs of different types of windows by geographic area. The site also offers downloadable fact sheets for selecting energy-efficient windows by city and state. Of course, having your windows properly installed will ensure that they live up to their potential. You’ll also want to read the product’s warranty information to see how the manufacturer stands behind its products.